Knopf Books for Young Readers, 9780385753845, 32pp. From the author-illustrator team behind the New York Times bestselling HOW TO... books comes a funny and heartwarming celebration of grandmas and grandchildren. JEAN REAGAN was born in Alabama but spent most of her childhood in Japan. She now lives in Salt Lake City, UT, with her husband. To learn more about Jean and her work, please visit jeanreagan.com and jeanreaganbooks.com. LEE WILDISH has illustrated a number of children’s books, including Twosomes by Marilyn Singer. To learn more about Lee and his work, visit wildishillustration.com. Together, Jean and Lee are the creators of the New York Times bestselling HOW TO... series, including How to Babysit a Grandpa, How to Babysit a Grandma, and How to Surprise a Dad. "Reagan and Wildish follow their bestselling How to Babysit a Grandpa with another sly how-to that guides readers through the finer points of babysitting one's grandparent... Wildish's cheery digital illustrations smooth over any potential moments of anxiety with lots of soft smiles and evidence of the close bond between this grandmother and granddaughter." "Any grown-up who has calmly been the object of a child’s flights of fancy will chuckle at the scenarios, as Grandma, never mugging or rolling her eyes, participates fully and patiently in all of her granddaughter’s ideas...The charm of its premise and the clear bond between the generations will have kids and grandparents giggling together." 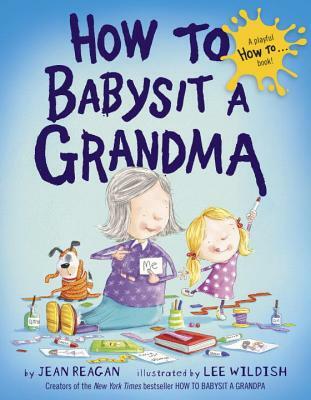 "Reagan and Wildish create a humorous follow-up how-to tale in this companion to How to Babysit a Grandpa (2012)...This silly take on role reversal will have preschoolers and early-elementary children plotting their own babysitting jobs."